Heat oven to 375°F. Spray 8-inch square (2-quart) baking dish with nonstick cooking spray. 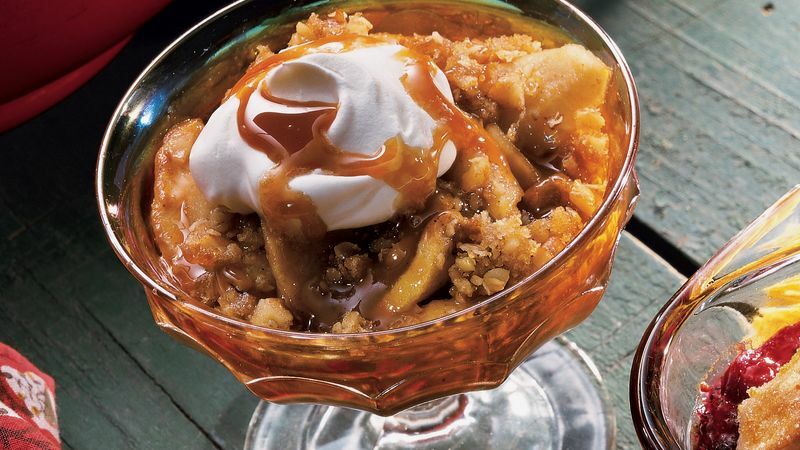 In sprayed baking dish, combine apples, pears, sugar and allspice; toss gently to mix. Drizzle evenly with ice cream topping. In medium bowl, combine brown sugar, oats, walnuts and flour; mix well. With pastry blender or fork, cut in butter until mixture resembles coarse crumbs. Sprinkle evenly over fruit mixture; press lightly. Bake at 375°F. for 30 to 35 minutes or until fruit is tender and topping is crisp. Cool at least 15 minutes before serving. To serve, spoon liquid from baking dish over fruit. Top with whipped cream and caramel ice cream topping. Store in refrigerator.